The current furloughs of air traffic controllers may be due to unique and unusual circumstances but after a single day of delays throughout the aviation system, it’s clear they should be halted immediately. On Sunday, the first day of the furloughs, lengthy delays at major airports in New York and Los Angeles inconvenienced passengers and contributed to further delays across the country despite mostly good weather and flying conditions. The delays could have been worse had the controllers not stayed after their shifts at key facilities like LAX Tower and Atlanta Terminal Radar Approach Control. Controllers did their jobs yesterday by keeping things moving safely, and as best they could manage during these unusual circumstances, efficiently. Even with the hard work and dedication of controllers forced to cover for their furloughed colleagues, delays are expected to worsen throughout the week. Rather than allowing the world’s safest and most efficient national airspace system to slowly degrade, steps should be taken to cancel or postpone the furloughs until a solution that keeps controllers on the job full time can be found. 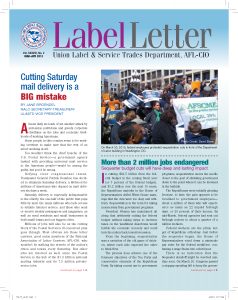 Cherri Senders, Publisher, Labor 411. As a public relations professional specializing in communications for labor unions, Cherri Senders signed an agreement with the Los Angeles Labor Federation that she would “buy union whenever possible.” For years, she’d research her purchases beforehand and armed with her shopping list, she’d live up to her agreement. 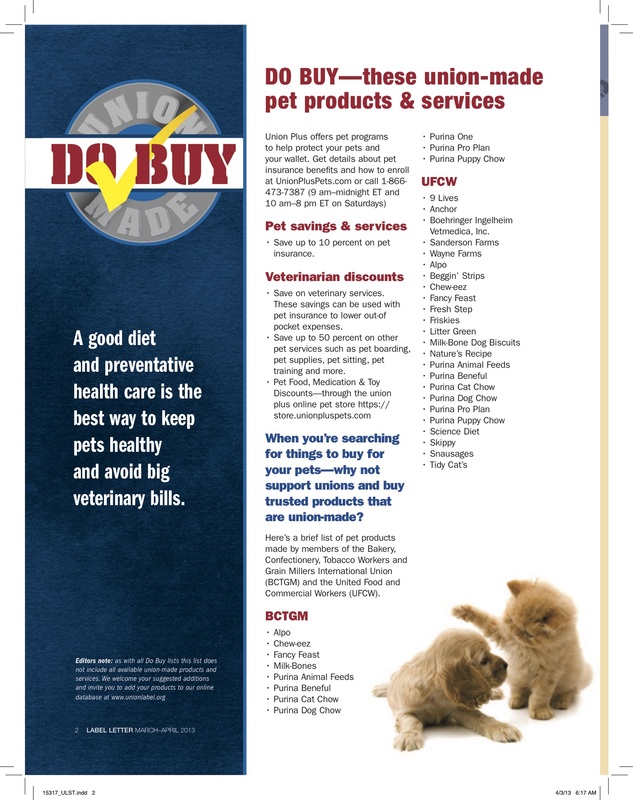 Senders wanted to support good union jobs so she finally decided that the labor movement needed an accurate and up-to-date union shopping guide—full of union-made products and services. And so Labor 411 was born. 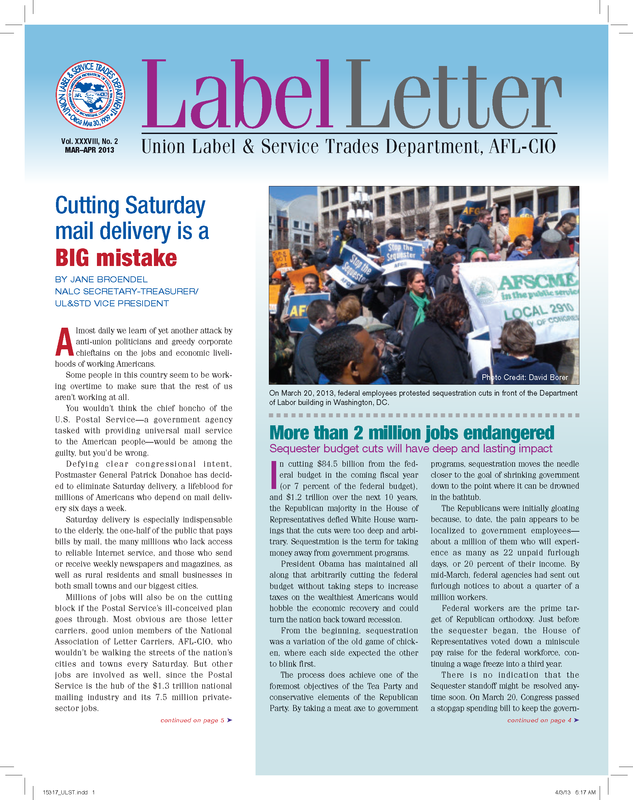 Editors note: the March-April 2013 Label Letter newsletter incorrectly identified Labor 411’s Website. The correct address is www.labor411.org. and $1.2 trillion over the next 10 years, the Republican majority in the House of Representatives defied White House warnings that the cuts were too deep and arbitrary. Sequestration is the term for taking money away from government programs. President Obama has maintained all along that arbitrarily cutting the federal budget without taking steps to increase taxes on the wealthiest Americans would hobble the economic recovery and could turn the nation back toward recession. From the beginning, sequestration was a variation of the old game of chicken, where each side expected the other to blink first. The process does achieve one of the foremost objectives of the Tea Party and conservative elements of the Republican Party. By taking a meat axe to government programs, sequestration moves the needle closer to the goal of shrinking government down to the point where it can be drowned in the bathtub. The Republicans were initially gloating because, to date, the pain appears to be localized to government employees—about a million of them who will experience as many as 22 unpaid furlough days, or 20 percent of their income. 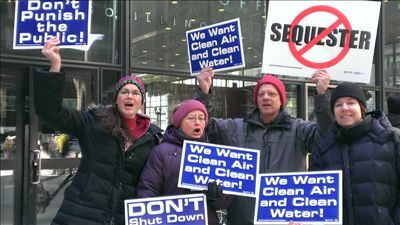 By mid-March, federal agencies had sent out furlough notices to about a quarter of a million workers. Representatives voted down a miniscule pay raise for the federal workforce, continuing a wage freeze into a third year. There is no indication that the Sequester standoff might be resolved anytime soon. On March 20, Congress passed a stopgap spending bill to keep the government open through the end of September, sidestepping the threat of a government shutdown, but sequestration cuts remain in place at least through September 30.
of restoring vital services expensive, and in some cases, impossible. News accounts estimate that 2.14 million jobs are in danger as a consequence of the sequester and 956,000 of those are “small business jobs” that depend upon government contracts. Local education funding will feel the pinch, forcing administrators to lay off teachers. Federal funding for police and public safety personnel will be lopped away. Programs such as Head Start, Food Stamps and Unemployment Benefits will feel the pinch. National Weather Service will be forced to postpone modernizing its weather prediction capacity, Social Security and the Internal Revenue Service will experience slowdowns in processing their work. Security lines and delays will grow in airports, air traffic control will be pared down and many small airports in various regions of the country will shut down. Food and meat inspection will be sharply curtailed—forcing some factories to suspend operations when inspectors are not available. Federal law enforcement agencies will experience staff shortages—from the Border Patrol to FBI agents, federal prison facilities, drug and firearm enforcement and others. Down another layer, billions of dollars in federal contracting will be constricted, cutting down shipbuilding and repair, research and development and the full range of national security expenditures. such as Lockheed and Boeing, Northrop Grumman and General Dynamics. The ripples will threaten jobs in health care, food service, travel, hospitality and more. that once average Americans begin to feel the pinch they will bombard members of Congress to demand a resolution.